PLYMOUTH’S Matthew Dixon smashed his personal best by more than 40 points to become British platform champion in front of his family and friends at the Life Centre on Sunday. The city teenager scored a stunning 494.30 points to win back the title he first won as a 14-year-old in 2014. His victory four years ago booked him a place at the Glasgow Commonwealth Games and his success on Sunday should secure him a place on the plane to the Gold Coast in April. Dixon, though, really had to hold his nerve in the final round as his big rival, Matty Lee, scored a staggering 99.90 points on his last effort. Lee had edged Dixon out for gold on the final round at last year’s British Championships in Edinburgh, but the Plymothian made sure the same did not happen this time by nailing his back two-and-a-half somersault and one-and-a-half twist to hold on for victory. 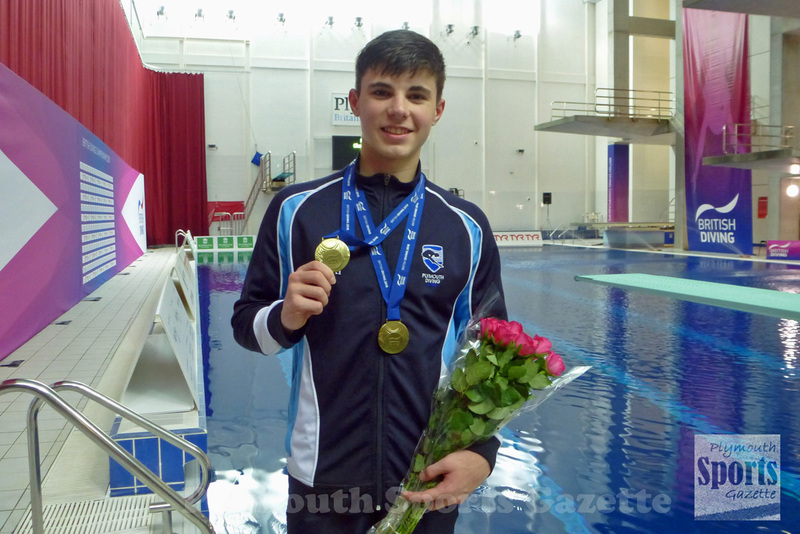 “I was really pleased with my whole performance and really happy that I got gold,” said the 17-year-old Plymouth Studio School pupil, whose lowest scoring dive in the final was 78.00 points. European junior champion Dixon now has his sights set on breaking the 500-point barrier. Dixon is also hoping he will get the nod to compete at his second Commonwealth Games. Plymouth-born world champion Tom Daley pulled out of competing at the British Championships, but, if fit, he is certain to be picked by Team England leaving two other spots available. Dixon and Lee are in prime position for those after finishing first and second on Sunday with the qualification standard. Dixon, who finished second in the synchro event with Noah Williams on Saturday night, said: “I have the qualifying points but we have to wait until the manager’s selection, which is a week-on-Monday. Hopefully, I have a good chance. Fellow Plymouth diver Aidan Heslop knows he is going to the Commonwealth Games. He was officially named in Wales’ squad on Thursday. And the 15-year-old justified his selection as Wales’ first diver for 20 years by scoring 413.30 points to finish fifth in Sunday’s strong men’s platform event. There was also an impressive performance in the platform competition by fellow Plymouth diver Euan McCabe. The 12-year-old just missed out on reaching the final by finishing 10th in an 18-strong preliminary round with a score of 303.00 points.